Today, I want to extend my warmest wishes to you, the members of SEIU: nurses, doctors, lab technicians, nursing home workers, janitors, window cleaners, bus drivers, child care providers. Thank you for your commitment, your talent, your hard work, and your service to this country. On behalf of everyone at the Department of Labor, I’m honored to wish all of you a great Labor Day. Labor Day is also a call to action, a reminder that we must defend that promise to ensure that dignity and opportunity remain the birthright of all workers in this country. It reminds us that workers’ rights, income equality, and the free exercise of collective bargaining rights are the backbone of an America built to last. We’ve come so far in the last 3 ½ years, but we’ve still got a long way to go. Over the last 29 months, we’ve created 4.5 million jobs. We must continue to get people back to work. President Obama understands that communities depend on the vital services you provide. He has called for investments that will fix our crumbling roads, bridges, airports and schools; prevent more layoffs of teachers and first responders; and keep more police and firefighters on the beat. For 90 years, SEIU has organized workers to give them a stronger voice in the workplace, and now is not the time to let up. Some say that we can’t afford unions right now, that labor unions are the problem in this country. But I think they’ve got it just plain wrong. Unions like SEIU helped build America’s middle class. You are now — and always will be — part of the solution. For me, this Labor Day has added meaning. My dad, who was a proud union member, passed away this year. When I was in ninth grade, he would come home and ask me to sit with him at our kitchen table. From his pockets, he would pull pieces of paper with writing in Spanish on them. They were notes given to him by his co-workers. There were all sorts of things scribbled on them: grievances about health and safety, questions about paychecks that didn’t add up, and ideas about how to improve the productivity of the line. He’d ask me to translate them into English. At first, I didn’t understand what they were. When I asked, he explained: “They are the voice of the workers.” It was from him, as a young girl, that I learned about the critical need for workers to have a voice on the job and a seat at the table. One thing is certain: the promise of the great American worker will never be broken. Working together, there’s no challenge we can’t overcome. 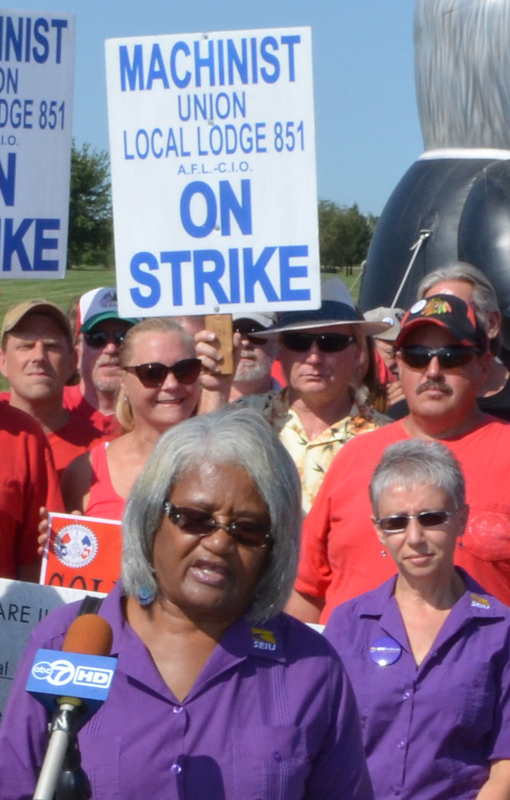 SEIU Healthcare Kansas/Missouri members joined the Kansas City 99% on August 30th, rejecting Mitt Romney and Paul Ryan’s vision for America with a rally and speakout while Romney prepared to accept the Republican nomination for president. The crowd of over 100 marched to Gymboree, a Bain Capital-owned corporation, with a clear message for Mitt Romney: We Don’t Want a Romney Economy! Two local Burlington Coat Factory workers spoke out about the struggles they face every day as low wage workers for a corporation that’s making a lot of rich people even richer – including Mitt Romney. Click here to see Mr. Wiseman’s testimony. People from all walks of life united on August 30th to demand an economy that does not reward those who outsource jobs, that ends tax breaks for the rich coupled with tax hikes for the middle class, and that stops funding cuts to critical education and healthcare programs that Americans rely on. 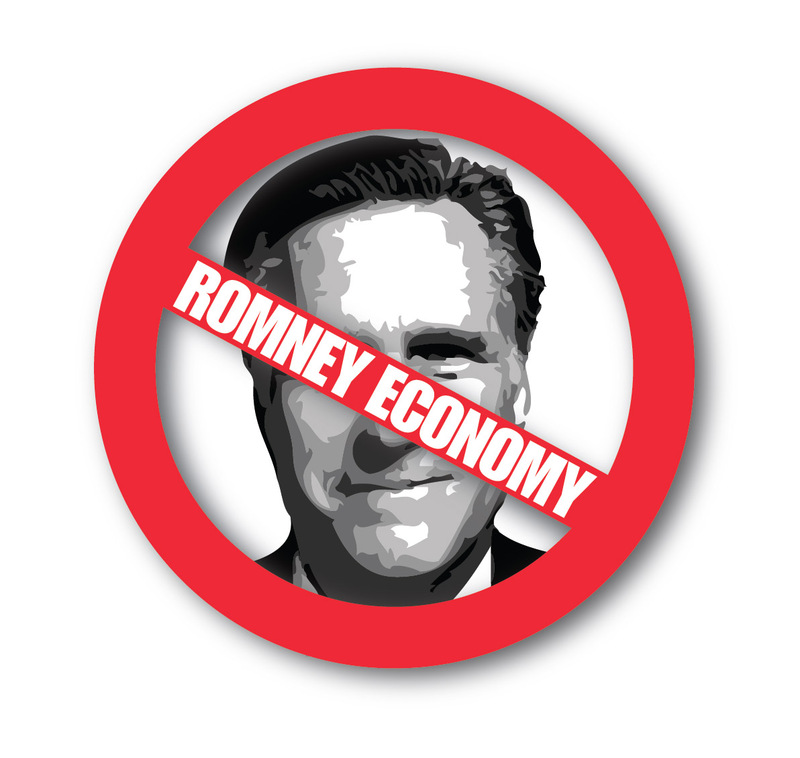 Across the country, the 99% – low wage workers, seniors, community activists, students, and faith leaders – roundly rejected the 1%-focused Romney Economy in favor of an economy that works for all of us. JOLIET, Ill.–In a show of solidarity within the labor movement, Illinois’ largest union donated financial support to striking Caterpillar workers in Joliet Wednesday, vowing to stand with them in their struggle for economic justice. Leaders of SEIU Health Care Illinois and Indiana (SEIU HCII), which represents more than 91,000 health care and child care providers, appeared at the Joliet picket line to present a $25,000 contribution to the fund supporting embattled members of the International Association of Machinists, Local Lodge 851. The local began its strike on May 1st after the Peoria-based manufacturing giant demanded harsh benefit cuts and a wage freeze, despite the company’s soaring prosperity. 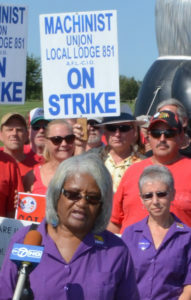 SEIU HCII Executive Board Chairwoman Flora Johnson addresses the media. “Our brave brothers and sisters on the Caterpillar picket line are taking a stand not just for themselves, but for all Americans who struggle to make a decent living while greedy corporations pad their fortunes,” added SEIU Healthcare Secretary Treasurer Myra Glassman. “At a time when the gap between the richest 1 percent and the rest of the 99 percent is historically large, this Caterpillar strike is a line in the sand for the American middle class. This strike is a battle to protect the American middle class, and if workers stick together, we will prevail. “This strike is not only about a fair contract with the workers at Caterpillar in Joliet, but it is also about the social contract that Caterpillar has made with the surrounding communities, so that these workers can work and retire with dignity without creating hardship on their families and communities,” said Steve Jones, Directing Business Rep., District 8 IAM&AW. Just last week Caterpillar reported a staggering $1.7 billion profit for the second quarter of 2012, a whopping 67 percent increase over the same period last year. The company is on pace to surpass its cumulative 2011 profit of $4.9 billion. Yet, even with those massive riches, Caterpillar wants to take more money from the pockets of the workers who have fueled its torrid financial performance. In addition to enduring the hardships of life without a paycheck, the striking machinists have had to withstand the summer’s withering heat to maintain the picket line. (August 3, 2012, CHICAGO) – To advance the cause for economic equality and opportunity, the Service Employees International Union Illinois State Council announced its endorsements for the upcoming general election on November 6, 2012. Representing more than 170,000 workers, the state’s largest labor union put its backing behind candidates who have demonstrated strong voting records on issues related to income equality, affordable housing, consumer protections, access to affordable health care and other needs that help keep working families and their communities stable, healthy and safe. “Each of these candidates has championed the needs of the working families united in SEIU and the millions of people they serve every day as home care and child care providers, public employees, medical professionals, security guards, janitors, first responders and social service workers,” said Tom Balanoff, President of the SEIU Illinois State Council. “SEIU members have a proven track record of helping to elect candidates who fight for stronger communities and against growing income inequality. 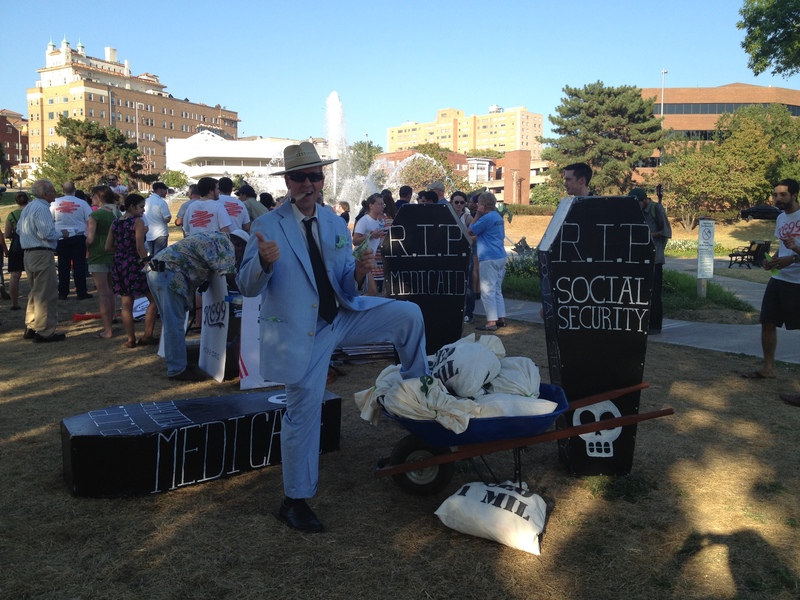 We look forward to continuing that trend,” said Christine Boardman, Treasurer of the the SEIU Illinois State Council. The SEIU Illinois State Council does not issue endorsements in uncontested state legislative elections where there is an incumbent officeholder. 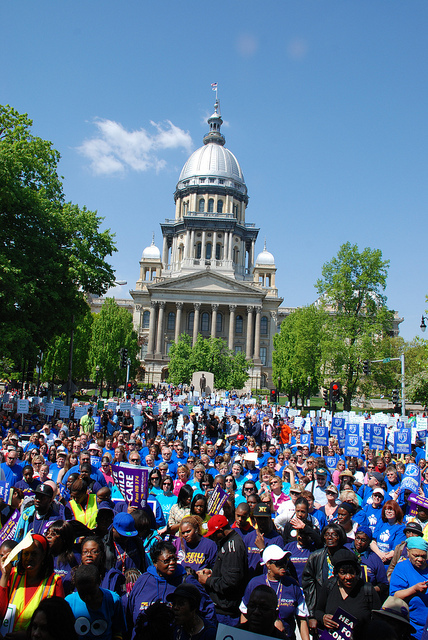 SEIU Illinois State Council represents 170,000 members throughout Illinois. 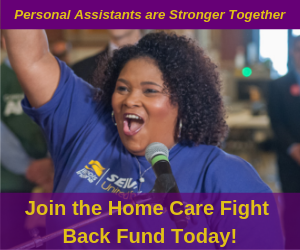 SEIU members in Illinois assist people with disabilities, care for senior citizens, educate youth, provide health care, protect public safety, clean and maintain businesses and buildings and much more. On July 24th, Rose Crawford, Denise Brown, Barbara Rosser, and Minnie Lee (pictured left) spoke at a rally at the Thompson Center in downtown Chicago about why home care workers need a “living wage.” The four women who work at the Department of Rehabilitative Services as personal assistants, called DORS-PAs, spoke about their struggle trying to care for their own families while making poverty level wages. DORS-PAs support and enable adults to live independently in their own homes without having to be placed in nursing facilities or institutions. The adults whom the PAs care for, called “consumers,” often suffer from major health issues, decreased mobility and live in poverty. 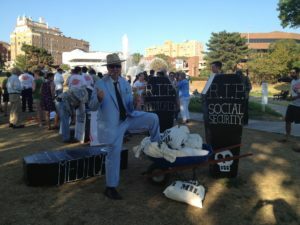 Check out two videos from our “living wage” rally as well as our profile of Barbara Rosser below. Barbara Rosser’s only consumer whom she cared for the last two years just passed away last week. She had been in hospice care since early May. Barbara hoped that in the last days of her consumer’s life she was not in any pain. She prays for her consumer’s family that they will find comfort amidst their loss. Barbara became a DORS-PA quite randomly. A friend of Barbara’s asked if she would check-up on a woman from their church. “When I first saw her she told me she was hungry and had not eaten any food all day. She said that her legs were so badly swollen that it was painful for her to stand up and even heat up some food. I jumped up and said we’re gonna get you something to eat,” Barbara said. This woman pleaded with Barbara to come and help take care of her and to become her personal assistant. “I didn’t even know what a DORS-PA worker was,” said Barbara. She knew it would be hard work, but said yes because she knew she could really help this woman. Even though DORS-PAs don’t make that much money and have to constantly scrape by – like deciding which bills to pay each month –they help their consumers have a better life. When Barbara’s hours got cut back from 32 hours to 25 hours and then on down to 20 hours she continued to care for her consumer several hours per week even though she wasn’t getting paid for it. According to Barbara, one night in late April when her consumer was alone, she slipped into a diabetic coma. Neighbors called 911 to rush her consumer to the hospital where she then suffered from heart failure. Days later she was moved into hospice as Barbara braced herself for the inevitable loss. 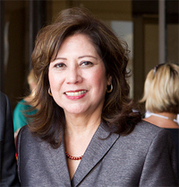 Barbara Rosser will tell you it is physically and mentally demanding to be a home care worker. But what she and her fellow PAs want is to be recognized and respected for the hard work that they do and the vital care they provide for adults who cannot completely care for themselves.